The selector valve RV 360 serves for use on front-end loaders of agriculture tractors. Indeed, the valve provides an optimized routing of hoses and increased productivity in the assembly of the loader. 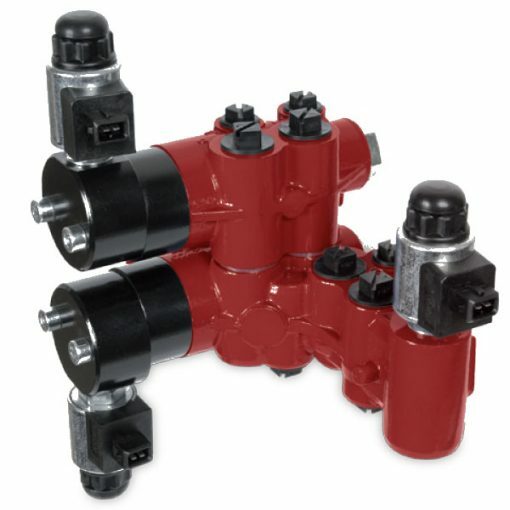 Only four hoses connections from the directional control valve are necessary. What’s more, the design of the valve is with RV 361 as the basic module for one implement function. This is extendable with a section to become RV 362 giving an additional implement function. The pilot-operation of the RV 360 allows achieving low internal leakage in combination with a reliable switching function. The pilot operation also gives a low current consumption. As an option, both RV 361 and RV 362 configurations can be with a cross-port relief valve. Furthermore, the basic valve RV 361 is available with connections for one or several accumulators for loader suspension. Then, the valve’s configuration is with a solenoid operated shut-off valve in order to switch the loader suspension system on/off. Please, note that it is possible to equip the valve with plug-in connections at delivery.